Yes, it’s real, Kingdom Hearts III exists and has been released, and you can even go and buy it now. It isn’t a hallucination! Tetsuya Nomura’s long-awaited follow up to his Disney/Final Fantasy crossover is out now on PS4 and Xbox One, once again bringing together multiple worlds from beloved Disney movies and remixing them into an action-RPG adventure. The series has been beloved by fans – particularly cosplayers – the world over for over a decade, and now Kingdom Hearts III brings a chapter of its tale to a satisfying, if surprisingly rushed conclusion. It might seem like fans have had to wait a long time for Kingdom Hearts III – 14 years since the release of KHII – but in that gap there have been multiple spinoffs, prequels and side-stories on various platforms, from Nintendo DS to a free-to-play game on mobile devices. However, it turns out they weren’t just a ‘nice to have’ stopgap solution, as Kingdom Hearts III reveals they were critically important to the plot of the ongoing story. And for anyone coming straight from Kingdom Hearts II – you will be lost. There are a few videos included in KHIII that vaguely explain the backstory, but your best bet is to pick up the recently released Kingdom Hearts: The Story So Far collection on PS4 which collects most of what you need to know to get started on this game. That said, it still doesn’t really go into the plot of the Kingdom Hearts χ series in the detail that you’ll need without plunging hours upon hours into those games. 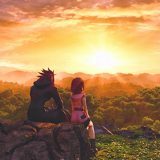 However, as someone who has been following the series over the years and playing each installment, I’m as up to date on the franchise as someone could be reasonably expected to be, and I have to admit that one of Kingdom Hearts III’s great joys is seeing how elements or plot details from all those spinoffs finally come together for emotional payoffs. These little moments are the best parts of KHIII‘s story, and it’s hard not to tear up at seeing long-separated friends reunited or a chuckle at a half-remembered plot element from a handheld game three generations ago suddenly coming up again with major importance. In essence, Kingdom Hearts III mostly revolves around our hero, Sora, and his best friends Donald and Goofy, trying to awaken Sora’s latent ‘power of waking’. To this end, they visit the worlds of Tangled, Toy Story, Big Hero 6, Monsters Inc., Pirates of the Caribbean: At World’s End, and Frozen, to learn how they can retrieve characters who’ve been lost across the series, like Ventus, Terra, Aqua, Roxas, Namine and Xion. The game’s story is awkwardly paced, as Sora leisurely visits each of the Disney worlds, he’s confronted by evil members of Organization XIII, who aren’t really up to anything important, just general villainy while speaking the same ‘heart darkness light heart’ jargon that has become a staple of confusion in the series. In fact, nothing of real importance that advances the story in a significant way occurs until after the final Disney world has been visited, which kicks off the final hours of boss encounters and all plot-relevant events. For a 30-hour game that’s meant to wrap up the events of a long-running series, it’s weird to see it dawdle for most of its length, and then rush the final execution. That said, these final boss battles are some of the most fun you’ll have in the entire game, with some dream-team face-offs for fans. Visiting the Disney worlds is a joy thanks to the crisp and lovingly executed visuals. Nearly all of the worlds this time draw upon Disney and Pixar’s CGI-animated films, and Kingdom Hearts III comes close to matching them one-to-one, even re-creating some key scenes that look damn near identical. In many cases, Square-Enix has been able to bring back the original voices as well, although in places where they haven’t, the absence is notable. The only drawback is, again, odd pacing in the long and frequent cutscenes which are strewn throughout the game, with awkward pauses and long silent action scenes punctuated only by grunts, in dire need of some rousing music. However, when music is used it’s frequently incredible, thanks to a team of composers including series-mainstay Yoko Shimomura which captures Disney magic and wonder with some amazing orchestrations, along with a couple of pretty catchy songs from Utada Hikaru. As Sora runs around the various worlds of Kingdom Hearts, fighting a host of enemies drawn from across the series including Heartless, Nobodies and the Unversed, he has access to a stack of systems to take the baddies down. Not only does Sora have access to his usual physical attacks and range of magic, ripped straight out of Final Fantasy, but the Flowmotion system from Kingdom Hearts 3D makes a return to allow him to bounce off walls, spin around poles and parkour around levels to add extra heft behind his attacks. Depending on the keyblade Sora is using, different ‘formchanges’ also allow him to transform for different and stronger attacks after raising his physical combo meter high enough, while combo-ing magic unlocks access to higher level spells. Sora’s various party members can also get in on the action with team-up attacks, or other characters can be brought in via ‘link’ summons for different, strategic attacks. And I haven’t even mentioned the new ‘attraction’ summons, that spawn neon-coloured versions of Disney rides like the Pirate Ship, Mad Hatter’s Tea Cups and Magic Carousel to deal even more damage. 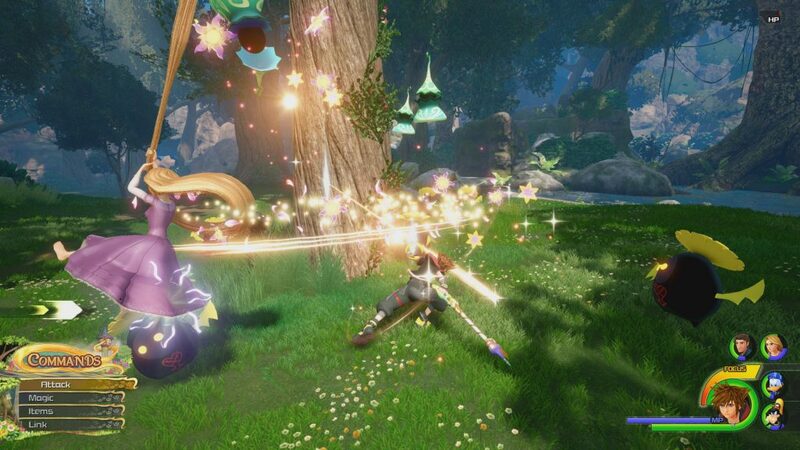 Simply put, there’s a hell of a lot going on at any one time in Kingdom Hearts III‘s combat, so much so that the various summons, formchanges and team-attacks often stack into lists because there’s so much available to you at any one time. You can rely on magic as much as you want, or barely touch that menu and go all-in on physical combos and formchanges. The sheer amount of power you have does make the game feel substantially easier than its predecessors – in fact I didn’t actually die or lose a fight until the last boss of the game. However, the sheer amount of Disney insanity all happening at once is pretty fun to watch, and the controls themselves have evolved substantially since the series’ PS2 days. Combat feels fast, fluid and responsive, moving at a pace unseen in the originals and, combined with the smooth visuals, makes for enjoyable and addictive gameplay that doesn’t wear thin despite some repetitive Heartless encounters. Some of the Disney worlds also toy with larger gameplay concepts, such as Big Hero 6‘s ‘San Fransokyo’ offering a sizeable chunk of city for Sora to parkour around and stop Heartless attacks, while Pirates of the Caribbean has a mini-stretch of ocean and islands for Sora to explore in a very Assassin’s Creed-like fashion. They’re not fully-fleshed out ideas, but do offer a stark contrast to the boxed-in worlds from earlier games, and a welcome bit of variety. Speaking of exploration – between worlds, the Gummi Ship returns in free-roaming space environments littered with shoot ’em up sections. These fare better than the Gummi Ship sections in the past, even if they’re still not entirely successful due to a weird straight-on perspective that makes it difficult to measure distance between you and shots coming for you. There’s also a fair bit to do outside of the main quest and level grinding, with a Ratatouille-themed and Final Fantasy XV-inspired cooking mini-game that asks you to hunt ingredients and make dishes to create buffs for your party. The Hundred Acre Wood returns for a few reasonable Match-5 puzzle games. Throughout the adventure, Sora can even collect Game & Watch-style mini-games based on classic Mickey Mouse cartoons. Square-Enix has even turned the classic ‘Hidden Mickeys’ of Disneyland into a pretty fun game-wide side-quest where Sora can find and photograph hidden Mickey Mouse symbols in each of the environments. 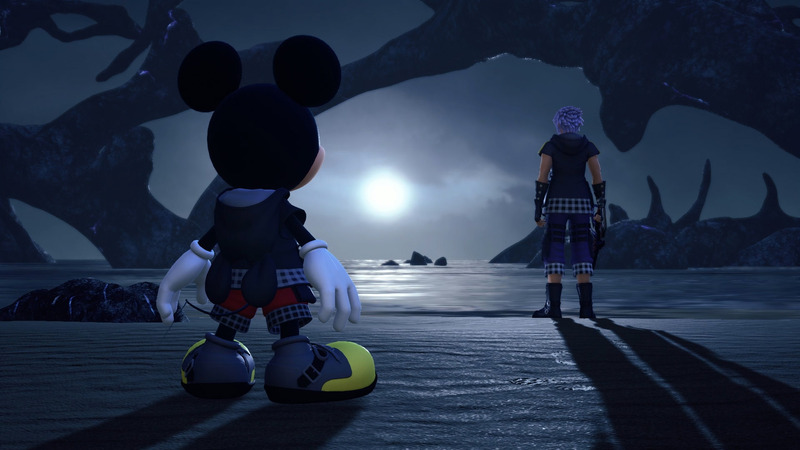 Despite the hours-long run of final bosses and concluding events at the end of Kingdom Hearts III, the saga is heavily implied to continue beyond this game, although hopefully in a more easy-to-follow fashion. The evolved combat and kitchen-sink stack of power-ups and gameplay systems make it a fun and brisk journey through its main story, although the awkward pacing and usual Kingdom Hearts jargon will have you cringing as much as you may be clapping at the most emotional moments. I enjoyed it as a worthy conclusion to this chapter of Kingdom Hearts, full of fun boss battles, weird crossovers, confusing dialogue and genuinely well-executed scenes that wraps up the decade of waiting for its own arrival. 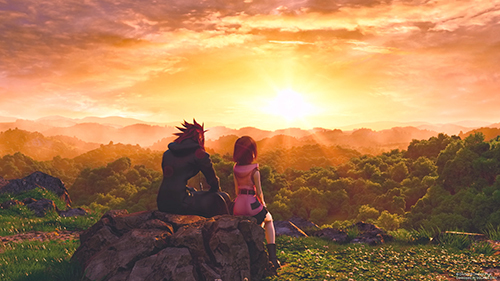 Where Kingdom Hearts goes from here is open for a whole new round of speculation, especially given its secret endings, but for now given the cluster-fruitcake that the series across its many titles, I’m satisfied with where we ended up in KHIII.